Aluminium, seamless constructions. This is used for experiments involving volumetric displacement of liquids. 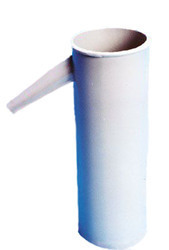 Polypropylene body, unbreakable, non corrosive white colour and has a spout to drain out overflowing liquids, used in laboratory for measuring displacement of liquids. 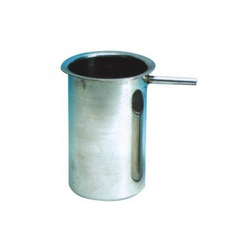 - Borosilicate glass cylinder with overflow spout. sizes : A) 250ml B) 500ml.